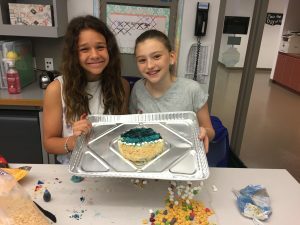 The Gaynor After School Program enriches students’ lives with a broad variety of activities – from sports and scientific exploration to community service and cooking – that keep them motivated and engaged after the regular school day ends. Led by Director of Student Life, Sue Sortino, the After School Program offers exciting new classes every year and enables students to learn, have fun, and importantly, build self-esteem, self- control, and responsibility. On any given Monday through Thursday afternoon, you will find After School students enthusiastically gathering in the North Building Cafeteria, Library or EC Kitchen for snack. Each area is bustling with excitement as the children chat, choose their snacks, and then are picked up for their various classes, proud of knowing the routine and then heading off to their exciting After School adventures. 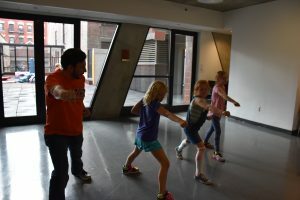 The classes are categorized under three main areas entitled, “Sports,” “Brainteasers,” and “Arts and Crafts,” and run the gamut from basketball, lacrosse, floor hockey, karate, and flag football through cooking, ceramics, drawing and painting, and fashion. There are even classes on super heroes, scientific wonder, robotics and coding, virtual reality gaming, chess, singing, guitar, yoga and zumba, just to mention a few. 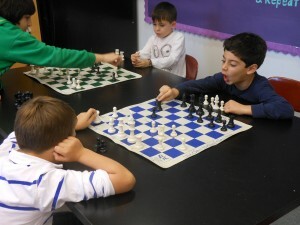 The After School Program takes advantage of the many and varied talents of our fantastic Gaynor faculty, in addition to a select few outside providers who have been with the After School Program for years, furnishing us with wonderful cooking, karate, and chess instructors. In addition, members of the faculty always assist in the classes where there are outside instructors. Additi onally, After School provides Gaynor students with the opportunity to join a small group of students in Study Hall for one hour, led by Gaynor teachers so students can stay one step ahead of nightly homework and longterm assignments. Gaynor Study Hall teachers are available to the students to clarify and reinforce learned skills and concepts while also helping with time management, organization and self-advocacy. Parents can choose to enroll students in Study Hall on a semester basis or as a “drop in” depending on need. Current parents can click here for information on classes and to register (you must be logged in to the Parent Portal to view this page).